The Gateway Arch: a Statue of Unliberty? 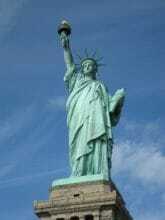 Is the Statue of Liberty still an appropriate icon for the USA? To an international audience, the massive monument is undoubtedly the country’s most famous and cherished landmark. Lady Liberty still welcomes crowds of tourists, just like she used to welcome immigrants with her arms wide open. But does she tell an honest tale? Is the USA as friendly and free as she implies? In actual fact, the country is closing itself off. They now have a president in office who wants to build a wall to keep immigrants out, instead of welcoming them in. A president who closes the borders, who says ‘America First’. It may be time for the US to embrace a different icon: a logo that would serve as a warning to the world. I would like to suggest an alternative monument to take its place. No need to build a new one, either, since my proposed alternative already exists: the Gateway Arch in St. Louis, Missouri, a gleaming catenary arch of stainless steel, 192 meters high and 192 meters wide. This landmark is not situated in a cosmopolitan coastal city, but in flyover country, USA. It may be less famous internationally, but its colossal stature fits the bill. I hadn’t seen it myself until I coincidentally ended up living in St. Louis for a while. 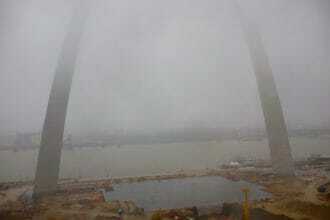 By now, I’ve reached the point that I think everyone should know about the Gateway Arch. The story that the Arch tells about the USA is much more honest. In 1967, the monument was dedicated ‘to the American people’ as a ‘memorial to the westward territorial expansion of the United States’. In other words, construction was completed just a few years before the first man was put on the moon, as a tribute to the country’s pioneering spirit. That makes the Arch a true monument to the ‘height of American power’, according to historian Tracy Campbell, who wrote a ‘biography’ of the Arch. But the Arch also has its darker sides, as I gathered from his book (Tracy Campbell, The Gateway Arch: A Biography, Yale University Press, 2014). Its construction was used as a clever excuse to demolish forty square blocks of ‘blighted’ residential property – which just so happened to be home to many African Americans. Moreover, it was an underhanded way to bring federal funding to the city. The official reason for building the memorial was not all roses and sunshine, either: that ‘westward territorial expansion’ was soon followed by driving out and killing off the indigenous population. 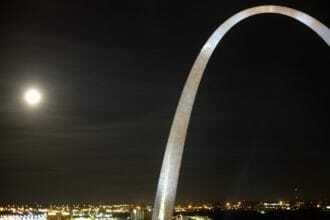 Some St. Louis residents therefore view the Arch as a monument to inequality. And it’s not restricted to the history books, either. Viewed from the Arch, you can almost see Ferguson: the suburb where its citizens revolted against modern-day injustice just a few years ago. Finnish sculptor and architect Eero Saarinen, who designed the Arch, had envisioned both a gateway to the city and a Romanesque triumphal arch. Incidentally, the artist was later criticized by a fascist architect from Italy, who claimed that Saarinen had stolen his design. The Arch was literally built in a place where minorities were driven from their land, to commemorate a genocide, based on a design which is marred by the taint of fascism. The Arch is a Statue of Unliberty. The monument teaches us that freedom has always gone hand in hand with a lack of freedom, long before Trump came along. At the same time, it also embodies that wonderful bravado, that optimism, that attempt to reach up and touch the sky. The Arch is not just any archway, it is a sweeping curve in the shape of a completely suspended necklace. The steel changes color depending on the light. Simply gorgeous. The Arch is as megalomaniac as it is elegant. All that is good and evil in America is united here. Its two pillars keep a polarized land trapped together, held in an immovable vice. The good news: the monument was renovated recently, for a mere 380 million dollars. This year’s 4th of July festivities will include an opening ceremony. It would be an excellent time to declare the Arch the new logo of the USA.